THE coolest website found ME and offered a giveway of something fabulous. I'm not exaggerating. This one's really cool. Read on, my friends. I'm glad I'm not the only one who thinks perpetual "dinner and a movie" dates are BORING! They have 4 different Hot Lunch Date Boxes to choose from and they will be giving away one of them to one of my followers (You'll get to pick your favorite).So, first, go check their website out so you know which Hot Lunch Date you'd want if you won! 2. Answer this question in the comments section of this post: What is the best pickup line used on you or the best way you've been asked out on a date? *Post my button on your blog. * Become a Facebook Fan of "Hot Lunch" and "Love, Actually Blog"
* Look at their Lunch Box Dates and write which date box is your favorite and why. What a delicious giveaway...I'm so exited about it! Get yourself entered...Giveaway ENDS Friday, November 20th. & I think the cupcake date would be the best! Oh my it’s been a really LONG time not sure I can remember one that was used on me. I did get invited to a double date by one of my good guy friends. I thought we were just having dinner and it ended up being a date. We were about an hour into the “date” before I realized it was actually a date. He called me a few days prior to the date and said, “I know a really cool guy that wants to take you out.” I of course not thinking of him in any other way as a friend said “Who!! !” he replied with “Me!!”. I still didn’t catch on, I thought he was being his usual funny self. The cup cake one sounds cute. Is an anonymous follower okay? I already am. As for #2, it has been so long...let me see...way back in high school I was sent on a treasure hunt to find out who was asking me out to a fall dance. Part of the treasure hunt was to find certain items in the cemetary (during daylight of course). I am a follower and the best date was when this guy came to take me on a surprise date but it was "room mate" night so the girls told him he couldn't take me out unless he took all of us out, and you know what, HE DID!! too funny! Also the cupcake one is my favorite, but the Mario one is down right weird, which is totally me, lol! I would probably do starry, starry night. I would love any of those dates! The most creative was a guy (my husband now) stole the very cool antenna ball form my car while I was at work. And left a ransom note saying if I didn't go out on a date with him I would never see it again. So I went out with him....and married him! I really really had to think on this. I have been married since I was 19 and didnt really date before that. But this one guy used to pester me at work ALL the time. Once he left a rose at my desk like everyday. The last day he asked me out. He really would have succeeded but I had met my WH and was smitten. I'm a follower and I just started following the I Heart Hot Lunch blog as well for an additional entry. I absolutely need the cartoons & cupcakes date night! We love love cupcakes and we are big cartoon fans...so this would really be a fun night! Okay the best way I've been asked out was a sneak attack. A guy was really nervous about asking me out and kind of got our really good mutual friend to set us up. Yeah, it seems corny...but I was really flattered he was so nervous he went through a back way to ask me out! Best pickup line was when a guy proposed to me, lol. Basically introduced himself and had a little small talk and then he asked me to marry him! Best pick up line used on me, well they all get used alot but my favorite is the one where, Hi, my name is Bob, I lost my number, can I have yours? Following on Blogger Followers and Google Reader! Thanks for the chance to win. LOVE this blog! I was also looking at their lunch boxes, such cute ideas! I think I would really like the drive -in or the cupcake one. Reasons are: me and my fiance love to cuddle up with some good snacks and watch a good movie. For the cupcake one, my fiance loves anything sweet, and cupcakes happen to be on of his most favorite. 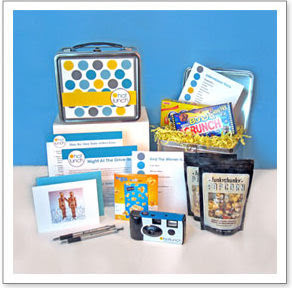 I would love to win one of these to use once we get married, what a fun idea! I don't like pickup lines....so I can't tell you the best one that was used on me. I was never asked out in a cute and creative way, however I do remember when I really liked this one guy and he called me up and asked if I would like to go on a date with him. He was totally nervous and it was just so cute. Became a fan of their facebook. My favorite of their lunch box's is the Night at the drive in one. The hubby and I love to watch movies together. I just think it would be so fun! Following hotlunchdates on Twitter. Thanks again for the chance to win! So I had to say I LOVE THIS BLOG! I am always so excited when there is a new post :-) I became a follower on the I Heart Hot Lunch blog, following them now on Twitter, became a facebook fan. . . .
Now the best line that was ever used on me was by my now husband the night we met. I had just dumped my boyfriend who kept asking me if he could make out with me. My husband thought it was funny so challenged me to a game of Uno. I am very competitive so he said if he won I had to kiss him, well I LOST! So I double or nothing, four different times. Needless to say we spent the night on the couch just kissing, seven months later we were married! Today is our anniversary!!!! I follow hotlunchdates on twitter! woot! Totally forgot to add, I like the Mario and Luigi box. My husband and I love to relax by playing old school video games. He works full time and goes to school full time so really any time I get with him is a date!! And as for the date...I was once asked out to a date through a puzzle that was left in my mailbox. I replied by putting a new label on a Jone's Soda bottle. Totally cute! I'm following Hot Lunch on Twitter. I subscribed to the Hot Lunch blog. I am a fan of Hot Lunch on Facebook. My favorite Hot Lunch Date is the Drive in one. They are all so cute, but my husband and I love movies and I would love to spice up a movie night with all of these fun things! I am a follower and I was once asked out on a date by one of the tiny acrobats at the circus! I guess he spotted me in the crowd during the show and at intermission, he came and found me and asked me out! He was seriously about 4'9"! I like the Mario and Luigi one. The mustaches are too much fun! Best pickup line? I was on a study abroad for art and the majority of our group was female. We were warned to be cautious, especially with the reputations of Italian men. One afternoon as I walked through the market in Florence a man called out to me, "You dropped something!" I turned around, he placed his hand on his chest, and added, "My heart." I laughed, gave him a thumbs up, and continued on my way. Best way I got asked on a date... It was Prom my senior year and I got home to find a cow sitting on my front porch. a note hanging around his neck saying " I would be utterly excited if you went to prom with me"
Sorry, had to delete my first comment. Didn't answer all the questions. I would get the cupcake box! But they're all cute! Became a FB fan of Hot Lunch. Subscribe to hot lunch blog. I like all the boxes! But I'd probably have to say the Martaio and Luigi one is cutest cause it would make us laugh with the mustaches. I am a follower and the best way some one asked me out was he gave me a plunger with almond joys flowing out of it and said I would be overflowed with joy if you went out with me!! I love the cupcake one it sounds so fun! I am a follower and I would have to say it's probably not the best pickup line used on me but it sure was the funniest and most memorable. A little boy told me that if I was a library book he would check me out! Ha! I would choose the Night at the Drive-In! I think it looks really fun! I'm a follower. I love them all! As I met my husband in High School there weren't any pick up lines. And my husband isn't very creative in setting up or asking me on dates (I always make the plans). So, in leue of leaving a totally lame message, I'll fill you in on what he did when he presented me with my promise ring (years and years ago...). He was still in Belgium while I was going to school in Minnesota. So he mailed me a video and the ring (in a box). I was instructed to not open the box until after watching the video. In his video he presents me with the ring. He didn't get on one knee "because that would be proposing." And he didn't just stand there "because that would be just giving me a ring." So, to compromise he half-kneeled and "gave" me the ring. It was our promise to stay exclusive while we were apart. My heart melted that night. My favorite lunch box date would be... Mario and Luigi. Italy is a country I have not been to... yet. Homemade pizza is my absoulte FAVORITE pizza ever. Plus, I've always wanted a mustache. How cute are these! I'm at a toss up between the Starry Starry night and the Cartoons and Cupcakes. I worked in the on-campus cafeteria while going to college where I made sandwiches and wraps. I don't know if the guys who came through the line actually wanted a wrap or just to talk to me, but most of the students I served were indeed male. One day after making a wrap for a frequent customer exactly how he requested, I handed it to him and watched him unwrap it and examine it carefully. When I asked him what was wrong he said, "you forgot something." Confused I started going over what he had requested on it, and asked him what I forgot. "Your number!" It was probably the cheesiest pick up line EVER, but it sure made me laugh! Starry Starry Night is my favorite because my husband and I enjoy looking at the stars when we go to visit my parents in the country. There's so little light polution where they are and the stars are SO bright and there are SO many of them! Kristi Beams: I am a follower!!! I'm a runner so my pick up line would be the classic..."Are you tired? You've been running through my head all day." I haven't ever been the receiver of a good pick-up line, but the night my husband-to-be told me that he loved me for the first time was pretty classic. I had told him that I liked him an awful lot. To which he replied, "I like you too. I like you like bees like honey . . . and bees LOVE honey." "Does this mean you're telling me you love me?" I asked. "Is that okay?" He replied. It was sweet and certainly memorable! I'm a follower, by the way. Visited their site, and I must say, I love the Starry Starry Night set. So much fun. What a clever site. I am a follower! What a NEAT idea!!!! Love this! Honestly, no awesome pick up lines. Seriously. I guess I always dated serious men. They were strait to the point. It would be a SURE hit. I am a follower! The best way I've been "asked out on a date" would have to be a Marine home on leave telling me that the one thing that he thinks about all the time is how he ever let me get away....and he will spend the rest of his life trying to figure out how he can prove himself to me.....we've been married 3 1/2 years! Mario & Luigi! We LOVE Italian! YUMMY! I'm a follower! and I have to say the worst pickup line ever used on me was- "Hey.. I saw that you haven't been asked to dance all night... so do you wanna dance?" I love the Drive Inn movie night. I also liked the pajamas and cupcakes.. but the Drive Inn was my ultimate favorite. I am now a follower. I can't really remember any good pick up lines but my husband did use the line "I have something in my eye" to get me to lean in for our first kiss. I like the drive in movie hot lunch date. I am a new follower and a new addicted reader! These days, the best way I am asked out is when my mom or mother-in-law says "hey, I'll watch the kids, why don't you two go out"
It's music to my ears! I really love the Night at the Drive-In date box...me and my hubby love movies so its perfect! Would you like to dance or is your sole function in life to stand around and look pretty? I think that the movie one would be fun! The night that my husband and I got engaged he called to ask me on a date (I had no idea that he was going to propose that night)and was acting really awkward, like we had never gone out before. I immediately caught on and we basically reenacted the first time he called and asked me out (almost exactly one year before). It was hilarious. He kept the charade going by calling me back the day of the date and making sure we were "still on" for the date. He came to "pick me up" and sat on my couch talking awkwardly with my roommates. (They had no idea what was going on, because he was so common in our apartment they called him our 5th roommate!) It was SO fun, and oh so perfect! I love the hot lunch idea... my favorite is either the cupcake date or the Mario and Luigi date. I am now a follower of Hot Lunch! One day I walked back to my car after a long day on campus, and I saw a yellow note. At first I thought, 'dang it! I got a ticket' but then realized that it was just a piece of paper. I picked it up and on the outside it said "TICKET", and on the inside it said, 'You'll have to pay a big fee because you got fiiiinnne written all over you!" I'm a follower of your blog! All hot lunch date ideas are fun!! I can't decide on a favorite! I like them all because it just means spending more time with my hubby!! The only pick up line I can remember was "I'm not drunk, I'm just intoxicated by you." I became a fan of Love, Actually blog on facebook. Love your ideas!! I don't know if this one would count but my husband and I met over a book. At a party he found my book and came out "Who's book is this?" got us talking and 6 months later dating. and my favorite way I was asked out was by the guy who became my husband only 6 months later. We were church camp counselors together and he sent one of his guys from his group to sit across from me at lunch, he sat down and said "are you kristin?" I said yes, and he winked at me all rico suave and did the little lip pucker thing and said, "that's from Cameron." It made my whole day! After Cam saw my reaction he came over and asked me out for the weekend. The best line I ever heard was, You dropped something, I looked down and back up and he said your smile. I was already married with kids, but it definitely made me smile. I would love to try all of the hot lunh date ideas. But, I would start with the Night at the drive in. I posted your button on my website. I'm already a fan of your on facebook and I will become a fan of hotlunch as well. I'm also a follower of hot lunch blog. After reading some of these comments on cheesy pick up lines and cleaver askings out I am racking my brain to try to think of something cute and creative but it brought me back all the way to high school prom. Some guy made sugar cookies with letters forming "will you go to prom with me" and even that isn't so amazing but it is what it is :). My favorite lunch boxes were the stars pack (my boyfriend and I have wanted to just kick it doing this but haven't yet so that would be fun) and the Italian one too. I actually had a really interesting situation. I was on a service mission in Salt Lake City, Utah. The FIRST day of my mission I met the most amazing boy ever. He worked in the building I served every day. We became really good friends and I started liking him a lot (and was pretty sure the feeling was mutual)so I went to my mission president to ask him what I should do. He told me that because I was just a 'service missionary' I technically could date- but that I had to have this boy come in and have an interview with him before hand. I'm sure 'Hi. I would like to go on a date with you but first you have to interviewed by my mission president first (who happened also to be a general authority)' was not the most common first date scenario. We've been married for two years now! (This is Mary Ludwig by the way. Aaron is my husband. I don't have my own google account) but I follow this one from his! Wow. I'll bet that story was sounding pretty intense coming from what everyone probably thought was a boy. haha. Whoops. Surprise Ending. I'm female! Anyway- I am a fan of this sight on facebook and a follower. haha---yes, when I read "this amazing boy..." I got a little confused. Thanks for clearing it up for us! GREAT story as well. Love it! Lots of great comments everyone..and lots of new followers (I hope they're here to stay, not just get the giveaway and ditch! :) regardless, I'm excited for someone to win next Friday!! 2 years ago (i was 22) after a christmas carol in front of a police station, a boy came up to me and asked if i'd been to Tennessee. Being completely confused I said, No why? His response: Oh, cuz you're the only ten i see..... awesome pickup line... too bad the boy was 12. Oh and I have your button! And the best way I was asked out... In high school everyone always did crazy creative things to ask you out, which was cool but lame because it never happened face to face. When I got asked to prom he just showed up at my work, I turned around and he was suddenly on one knee in the middle of the Cougareat with a big pink rose, and asked!! So cute! I am a follower (totally new). And the best way I have been asked out on a date has to be from my old college sweetheart. We were just getting to know each other and had not actually been on a date yet. We were talking about our exams and somehow we got into motivations for doing well. He asked me if I would go on a date with him if he did well on his computer exam (I would have gone out with him on a date if he had failed but I didn't tell him this). I told him if he got better than a 95 on his exam (it was 100 questions), I would go out with him that weekend. I agreed that I would and a few minutes later her went off to class and I went to mine. Later that day as I was walking to my car, he came running up with the Scantron sheet. He told me that he asked the instructor to please grade it right away because he had a date on the line if he did well. He handed me the Scantron and on it the instructor wrote "98 wear something cute on your date!" It was definitely one of the best ways I had ever been asked out. I am a fan of Hot Lunch and Love, Actually Blog on facebook. I subscribe to Hot Lunch blog via google reader. My favorite Hot Lunch date is Night at the Drive In. First of all, we love watching movies together and snuggling up on the couch. Second, it would be a blast to take some silly pics on our "movie date" but most of all, my husband proposed to me at a Drive In in California. So it will always be a special kind of event for us! Thanks for the great giveaway! I have your button posted on my left side bar. I am now a follower :) I found your blog two days ago, and I'm really liking looking through all your neat ideas. The most memorable date ask-out I've had was from my first boyfriend. It was my sister's birthday and my family was at the table eating cake when there was a knock at the door. My dad answered it, and in walked a line of young men in dark suits and sunglasses. We were ordered into the living room, where the young men stationed themselves like some kind of Secret Service. After some "communications" via earpieces, my boyfriend was escorted into the room, wearing a tuxedo. He handed me a rose and asked me to prom. When I said yes (actually, I said "sure," which his friends teased him about), his "aide" opened up his silver briefcase and pulled out a contract which we both signed. The best part of the contract, though, was that he would pay my dad eight cows! And all this after a consultation with my best friend the day before in which we decided he probably wouldn't ask me to prom! I didn't marry him, but that was a pretty cool way to get asked out. Also, the cows weren't real; they were stuffed animals, delivered in the same silver briefcase that the contract had been in. I follow - the best way I've been asked out on a date was with chocolate hidden in my room when I was out (I shared the room with my friend - it's not like the guy broke in). I didn't go, though. I like the starry starry night box - I think we could make some rockin' S'mores with chocolate covered graham crackers :) although they might be a bit messy . . . It has been so long since i have heard a pick up line but i keep thinking of..You look good in that shirt,can i talk you out of it? Something like that haha!! Also..You look good in that shirt,but i would look better on you. I would surprise him with Mario and Luigi and have a special Italian Hot Lunch date!! can't think of a pick up line used on me but when my hubs proposed he had a rose up his sleeve, he pulled the rose and the ring out of his sleeve and proposed--one of the best:) days of my life!!! I posted your button on my blog! I subscribed to hot lunch blog! my favorite is cartoons and cupcakes date because i love when the "little boy" in my hubs comes out to play!!! I'm a follower and I don't think I have ever been asked cute but I have been answered cute. When I was in high school I asked a boy to a dance and he responded with a yes made out of oreos on the windshield of my car- the cute thing was I was at work and he only knew the general area I worked in so he drove around until he found my car. The box lunch I would like to win is the Mario and Luigi one. I don't have a whole lot of creativity in my dating past, but I heard of a guy who was an EFY couselor and had a crush on the nurse EFY couselor and convinced the kids to go tell her that he had hurt his ankle while chaperoning the dance. She came rushing in and when she asked what happened he said "I hurt my ankle really bad, but I think it would feel better if you danced with me!" Thus they began and are now happily married! I also heard a guy named Graham say "You be the honey, I'll be the Graham." Pretty cheesy! and I absolutely LOVE the Mario one! We love to bake together! I'm a follower and have been since about the beginning. I love your stuff! Okay, I'm a follower of hot lunch! AND I love the Starry Starry night box. It would get my husband AWAY FROM THE TELEVISION! I just became a Google Follower. I really like the Starry Starry Night Date Box. I love going star-gazing with my husband! Oh I am a follower as well! I'm a follower of hot lunch blog!! The cutest way I have been asked out wasn't actually when I was dating and out on the market. In fact I was married. My husband called me and casually asked how my day was, then asked if I would be interested to go out that night. I said yes (of course) then he came home got ready.. and said are you ready for our date? We went out, and when we pulled into the driveway back home that night. He leaned in for a kiss and said.. Thank you for letting me take you out.. I would like to do it again some time. It was fun because I was wasnt the only one trying to do little cute things to keep up the fun. He just acted like we weren't settled in and we were a new couple again. I loved it!!! The best way I was ever asked out...hmm...it's been a while! My now-husband responded to an email forward I sent his friend asking me to lunch. It was weird because we had never talked and I didn't know who he was, but cute because he had been "scoping" me out for two weeks before getting up the courage to ask! Oh, I forgot to mention I follow you! And now I'm a fan on Facebook. I subscribed to Hot Lunch's blog and became a fan on FB. I am following you both on Twitter as of...now. I like the Cupcake one, and the Mario and Luigi one. CUTE!